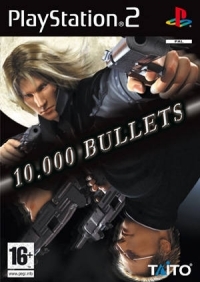 Box Text: The Power of "10.000 Bullets". Enter Crow and Judas, professional hit men who handle all the "dirty work" for the Tonio Family, a powerful crime syndicate based in Rome, Italy. Use the Bullet Time feature, pay Attention to the Gun Gauge! Replenish Gun Gauge with Combo Attacks, go for Critical Shots! Special Skills allow the characters to perform superhuman feats of strength. 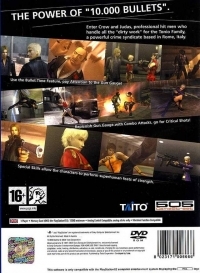 07-25-2016 agozer Box Text The Power of "10.000 Bullets". Enter Crow and Judas, professional hit men who handle all the "dirty work" for the Tonio Family, a powerful crime syndicate based in Rome, Italy. Use the Bullet Time feature, pay Attention to the Gun Gauge! Replenish Gun Gauge with Combo Attacks, go for Critical Shots! Special Skills allow the characters to perform superhuman feats of strength. This is a list of VGCollect users who have 10.000 Bullets in their Collection. This is a list of VGCollect users who have 10.000 Bullets in their Sell List. This is a list of VGCollect users who have 10.000 Bullets in their Wish List.